Gluten- free Caribbean empanadas with mango salsa from Our Four Folks is a tropical twist on this traditional Latin dish. The dough is made from chickpea flour, coconut oil and non-dairy milk. Not only is this dough vegan and gluten-free but it's also nutritious. Chickpea flour is high in fiber and protein. The filling is made from a mixture of mashed sweet potatoes, kale, chili peppers and spices. 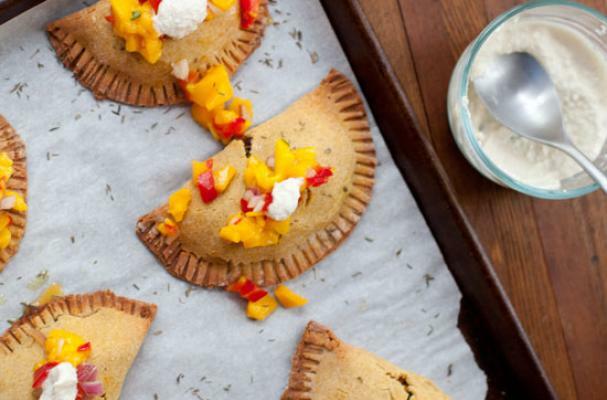 A fresh mango salsa and cashew cream is served alongside these delicious baked empanadas. For full recipe instructions, click here.